Gold bugs have had much to celebrate in the past few days as the precious metal continues to hold its own in the $1000 price region. To the various factors currently supporting the spot gold price we can now add the supply side issue which according to Evy Hambro gold production continues to fall as existing mines deteriorate and are not being replaced. Given that it has taken 10 years for the spot gold price to go from $250 an ounce to over $1000 gold producers will need to see prices stabilize and hold at an economically viable level before gold traders and investors need worry about an oversupply. From a technical perspective yesterday was an interesting day for trading gold in the spot gold price market, as the daily gold chart ended the trading session with a very long legged doji candle, with a deep lower wick, which once again tested both sides of the $1000 per ounce price level, finally closing marginally above at $1003.42 per ounce. Technically there are several important points to note from today’s price action on the daily gold chart. First, the open and close of the trading session seemed to find support from the 9 day moving average which provided the base for gold prices. Second the depth of the lower shadow would suggest that the bulls are still firmly in the market, with the lower wick suggesting that we may see a rise in the spot gold price tomorrow as a result. Finally, the low of the trading session found a degree of support from the 14 day moving average, which again is a positive signal, and coupled with the support from the consolidation level immediately below. 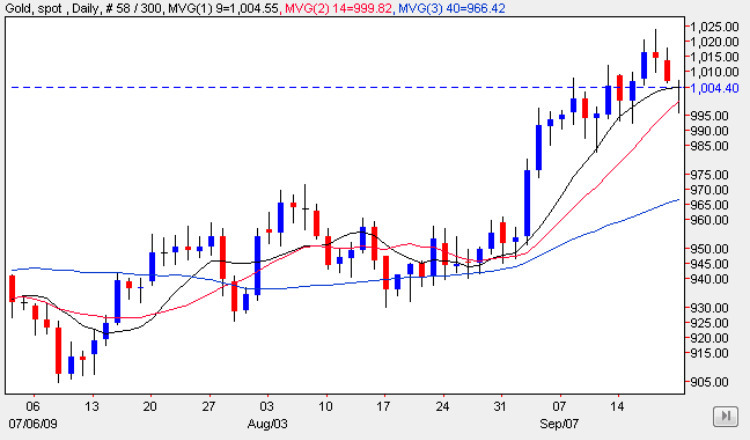 Given the above analysis, today’s price action on the daily gold chart would suggest that the reversal of the last two days is simply a minor pullback following the sharp rally of the last three weeks, and as such we should see gold prices consolidate and then move higher in the next few days on the spot gold price chart. With all three moving averages pointing sharply higher there is nothing to suggest that the current rally has run its course just yet.